Line a 9×9 inch pan with foil, going in both directions and letting some hang over the edge for easy removal later. Spray with cooking spray. In a large microwave safe bowl put the chocolate, the butter and the condensed milk. Microwave on high 1 1/2 minutes. Remove and stir. If the chocolate is not completely melted, put in back in the microwave for another 15 seconds and stir again, letting the residual heat in the bowl finish melting the chocolate. When it’s completely smooth, add in the vanilla and nuts and stir to combine. Spread into the prepared pan and smooth out the top. 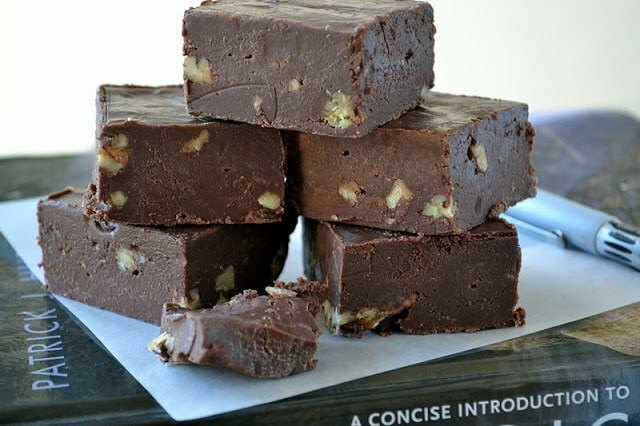 Remove the foil sling from the pan and carefully peel it off the fudge. Cut into squares with a sharp knife.